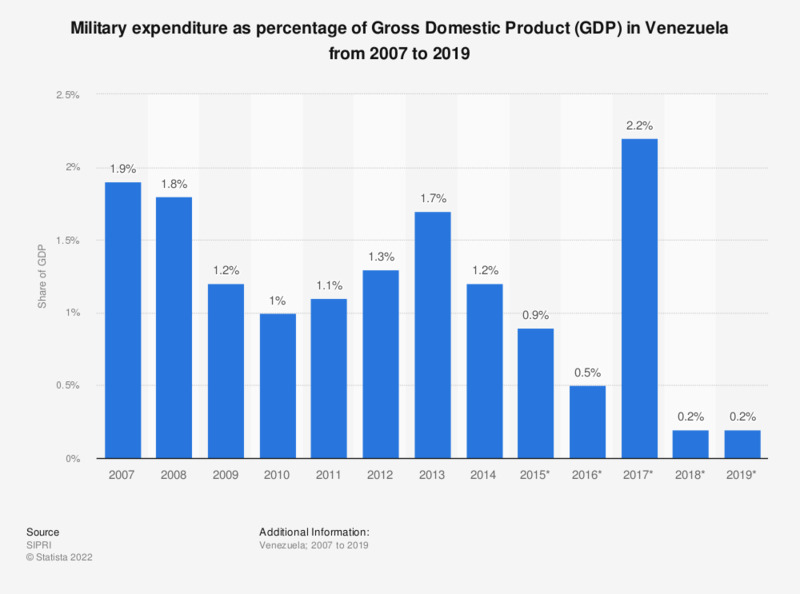 The statistic shows the military spending as percentage of Gross Domestic Product (GDP) of Venezuela from 2007 to 2017. In 2017, the military budget reported by Venezuela accounted for approximately 0.5 percent of the country's GDP. The source provides the following additional information: "The figures for Venezuela include off-budget military spending from the National Development Fund FONDEN, created in 2005 and funded by contributions from the Central Bank and the state oil company PDVSA. Actual figures for FONDEN are from 2005-2015, estimates are made for 2016 and 2017 based on 5-year rolling average of the share of off-budget spending to total military spending. (...) The figures from 2015 to 2017 should be treated with caution due to the very high rate of inflation and currency depreciation in Venezuela".